Awards season continues with all the glamour you’d expect on the red carpet. This time, it’s the fashion at the 21st Annual Screen Actors Guild Awards, a prestigious gathering in honor of the incredibly talented group of film and television actors. Because this awards show is unique in that it only honors performers, it’s a special evening where we can see Hollywood’s most talented all in one place. And, as was evident on the red carpet, the most stylish as well. If you didn’t catch the red carpet arrivals before the show, then here’s my roundup of the best and brightest looks. Below (left to right): Vintage glam was the theme for Maria Menounos,Gretchen Mol, and Emmy Rossum, all in delicate lace, brocade, and shimmery details. Below (left to right): Delicate, ladylike and all-around put together looks on Felicity Jones, Julie Bowen, and Reese Witherspoon – one of my absolute favorites of the whole night. Below (left to right): These ladies all wore black with their own spin on the look. Joanne Froggatt, Sophie Turner (love those shoes! ), and Sarah Hyland (another one of my favorites) were all stunning. Below (left to right): Even more ladies rocking the black look put a modern edge on an otherwise classic color. Rosamund Pike went for volume, Sarah Paulson paired black & white, and Emma Stone was inspired by menswear. Below (left to right): These three actresses opted for head-to-toe print. These are definitely not looks you’ll forget. 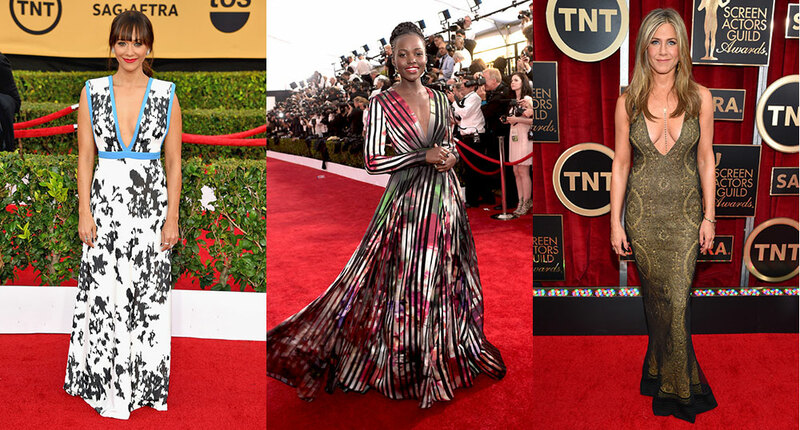 Rashida Jones, Lupita Nyongo, and Jennifer Aniston each rocked a bold look. 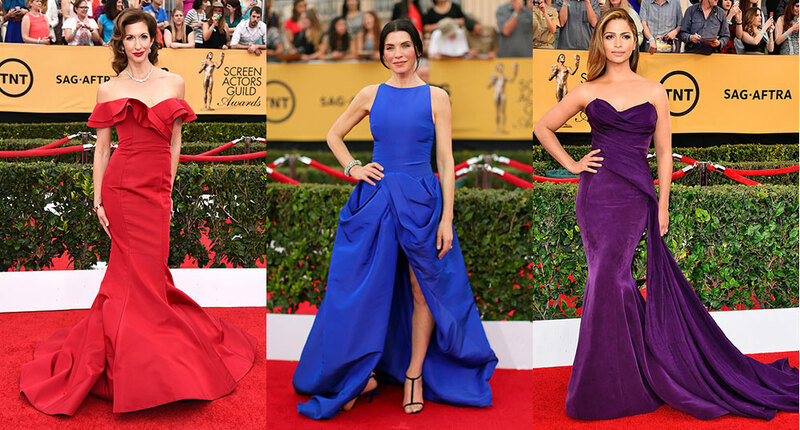 Below (left to right): Bold color, volume, and classic glam all converged in these looks worn by Alysia Reiner, Julianna Margolies, and Camila Alves. The men of the red carpet also deserve some attention. These four gentlemen looked particularly handsome in classic, polished suits. From left to right, here are: Mario Lopez, Ellar Coltrane, Eddie Redmayne and Kit Harrington. So what did you think of the looks on the red carpet tonight? Which was your favorite? Any misses? Tell me in the comments! For even more Red Carpet coverage from the 2015 SAG Awards, visit E! Online.